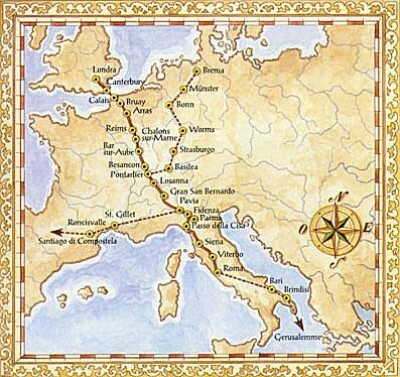 The Via Francigena was the pilgrims way from Northern Europe to the Holy See, a path that, in the Middle Ages, connected Canterbury to Rome and that today is having more and more touristic interest. Although it may seem strange nowadays that we live always in a hurry, people used to move a lot also in the past even over long distances. In the Roman Empire age in fact, a network of paved roads ran through Europe and merchants and travelers, wagons, generals and armies, spent weeks or months on those roads traveling. Even the barbarian invasions did not put an end to the constant travel, and trade routes in the Middle Ages were joined by paths that led to main destinations of medieval Christianity: Santiago, Rome and Jerusalem. The Archbishop of Canterbury Sigerico was the first to draw the route of the Via Francigena. In 990 he went to Rome to visit Pope John XV and on his way back he noted in a journal all the stages. That document is now preserved in the British Library. Now that almost one thousand kilometers journey is enriched and reconstructed through other contemporary accounts and rediscovered in its original 79 steps to Rome. Seven Italian regions are crossed by this path: from the Gran San Bernardo in Valle d'Aosta, through Piedmont, Lombardy, Liguria, Emilia Romagna, Tuscany and Lazio. It has been recently added the Via Francigena del Sud, who takes from Rome to Brindisi, for embarkation to the Holy Land. People wanting to walk through it can receive the credential attesting to the status of "pilgrim" and finally the Testimonium, if they consecutively along the last 140 kilometers to Rome. In 2014 about 25 thousand people marched in at least a part of the Via Francigena, half of which are Italian. As for Tuscany, there are 38 municipalities crossed by the Via Francigena, from Pontremoli to Siena and San Gimignano; multiple paths you can go by car, on foot, by bicycle and even on horseback! 380 safe km to rediscover itineraries rich in history, culture, architecture and a lot of nature that excites. For those wishing to start this great journey and stay in Tuscany, we have many and varied solutions to propose.